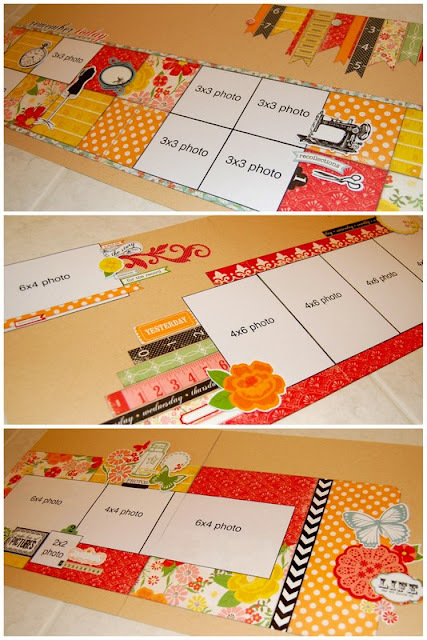 SCRAPBOOK GENERATION: Super-Saver layouts for January! We'll be making these three layouts Saturday, January 5 in the Debbie Sanders Super-Saver Scrapbooking sessions at Scrapbook Generation. As always, your cost to make these three layouts at SG is an amazing $9. Give us a call at 417-886-0440 to register and pre-pay. Sessions are held at 10, 12:30 and 2:30. And don't forget that starting January 2, we'll begin the "SG Loyalty" program, a new customer loyalty program that rewards people who shop in our Springfield store through a computerized point system. When you reach $50 in purchases (excluding kit clubs, all classes which require pre-payment, and gift cards), a coupon for $5 off your purchase on a future day will be generated as part of your receipt. The coupon can be used to purchase anything at SG except kit clubs and gift cards. You'll earn double points for your entire purchase by attending and participating in the Super Saver Scrapbooking class shown above! Note to Super Sketch Club members: Yes, materials for these three layouts will be included in your January kit! • The fee for a kit is $10, and is due at the time the request is made. • The best deal for our long-distance customers? Join the monthly Super Sketch Club and get this kit, the Sketch Day One layout kit, and the Sketch Day Two layout kit (includes materials and sketches for five double-page layouts, plus two bonus double-page sketches) for $20 plus $6.99 shipping. Blow-out sale continues for three more days! Club and class changes simplified! Online SG gift cards now available!